Age related macular degeneration (AMD) is a general term for many different conditions affecting the macula, the center of the retina. Vision changes can range from mild symptoms such as the need for more light to more severe vision loss resulting in a large blind spot right in the middle of one's vision. 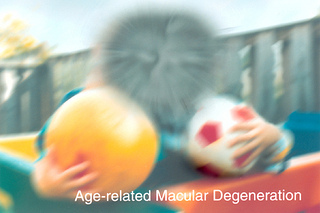 The stages of AMD are early macular degeneration, intermediate and advanced. Most people associate severe vision loss with wet macular degeneration, however the advanced form of dry macular degeneration, called geographic atrophy (GA) can also result in vision loss that affects one's quality of life. Just as there is central vision loss with wet macular degeneration, a person with GA can also experience a blurred spot in the center of his or her vision. This spot can become bigger and darker as the macular degeneration progresses. Much of the research for dry AMD is focusing on geographic atrophy and the processes that are involved in the progression of this retinal disease. Find out how a common antibiotic may help to inhibit the inflammatory process that leads to advanced AMD.